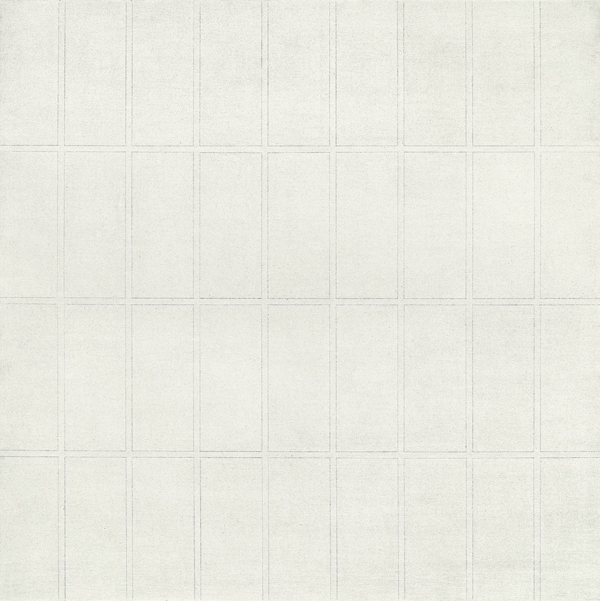 At SFMOMA, seven Agnes Martin paintings are displayed in an octagonal room. 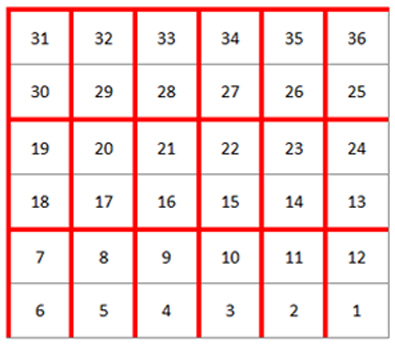 All of them are grids, or their prototype, rows. I’ve been puzzling over Martin’s grids the whole five years since I first saw her work. Critics present the grid — a chronic structure in modern art — as a sovereign and detached figure. Rosalind Krauss, foremost philosopher of the form, writes in her article “Grids” that it is “modern art’s will to silence, its hostility to literature, to narrative, to discourse […] it is what art looks like when it turns its back on nature.” The grid is made out to be a statement of autonomy — of resistance to any tether to the world — as well as a climax, because what could follow the grid? What could further abstract from the Cartesian plane? But in Martin’s work I see more than just a “staircase to the universal,” even a mystical one. Where Krauss may have it right that many grids turn away from the world, at once containing themselves in a self-referential map of their own surface and creating an infinite system of coordinates, through Martin’s grids it seems that you can see earth. Wheat, one of the paintings hanging in Martin’s SFMOMA oratory, has five colors. Two shades of gray frame the painting, the verticals darker than the horizontals. A pale taupe column, wider than the border, runs down the center, spanning the top and bottom lines of the frame. The remaining space is divided into four imperfect squares. The bottom two are a pale yellow; the top ones are a shade between that yellow and light brown. It feels like Canada, or the prairie Midwest, as much as it feels like inwardness, silence, or any of the other ethereal abstractions commonly applied to Martin’s work. This is not to say that the painting is “about” the Midwest, but to acknowledge that grids are not only abstract forms; they are also earthly ones. When Krauss writes that “one has to travel a long way back into the history of art to find previous examples of grids,” it signals that she has turned her own back on nature. Poke your head just over the disciplinary wall of art, and grids are ubiquitous. Two types of grids structure the surface of North America: the dense grid of cities and towns, and the cadastral survey of six-square-mile “townships” across the Midwest and West of both the United States and Canada. Martin’s biography engages with these North American grids at multiple incarnations and scales. She was born in 1912 in Macklin, Saskatchewan, a gridded wheat-growing community, to Scottish Presbyterian farmers, and she spent her career between Manhattan, whose grid dates to the city’s 1811 Commissioner’s Plan, and New Mexico, where the grid begins to fall apart, finally making concessions to both environment and non-Anglo epistemologies. The checkerboard visible as you fly over the middle of both the United States and Canada is a result of each country’s survey system. 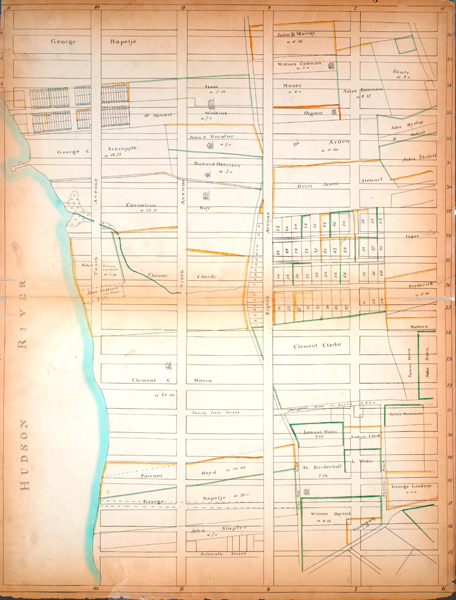 Canada’s Dominion Land Survey was based on the United States’ Public Land Survey System, also known as the “cadastral survey,” a colossal effort to provide a comprehensive description of the land that the United States had acquired into its public domain — everything from the edge of Pennsylvania westward — as well as to clarify land titles, establish a system of records, and promote orderly settlement. It took its form from the Massachusetts Colony, which had allowed town land grants of six miles square — considering that the suitable size for plantation — back in 1634. The Canadian Dominion Land Survey began in 1871, following the purchase of Manitoba, Saskatchewan, southern Alberta, and other areas from the Hudson’s Bay Company. It aimed to transform Canada’s plains provinces into agricultural economies, while also establishing a clear system of settlement. In both countries, the six-square-mile township, the primary unit of the survey, was also divided into thirty-six “sections” of one square mile, or 640 acres, apiece. Each section carried its own number, and was in turn divided into quarter sections: southeast, southwest, northwest, northeast. In the United States, the primary means by which the government disposed of its public lands were the Homestead Act and the Timber Cultures Act, both of which operated at the 160-acres, or quarter-section, scale. Canada’s 1872 Dominion Lands Act similarly offered quarter-sections for just a $10 administration fee. The Saskatchewan homestead records show that Malcolm Martin, Agnes’s father, received part of their farmland as a “South African Scrip”: 320 acres offered without fees to soldiers or nurses returning from the Boer War (1899-1902). 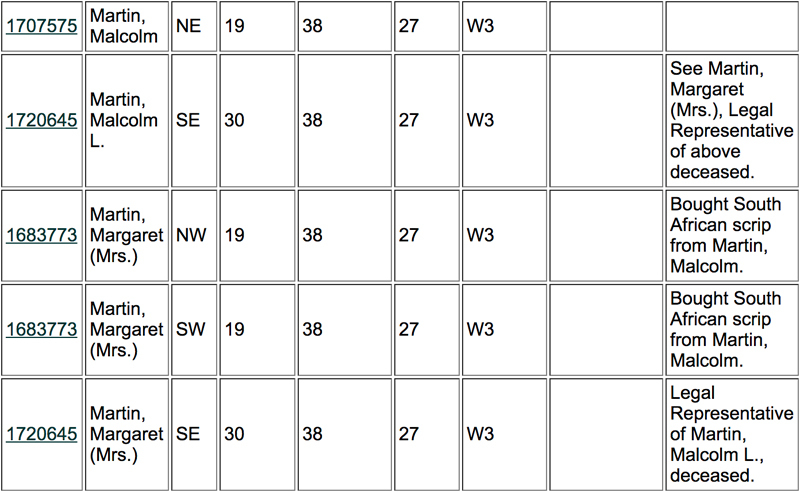 The records also show that Martin’s parents owned two quarter sections in section 30, and three in section 19, of township 38. Source: The Saskatchewan Homestead Index. Though the Dominion Land Survey replicated the United States Public Lands Survey in many important ways, it was also partially an effort to assert Canadian sovereignty over those lands, and to forestall American encroachment. For this reason, its initial plan adjusted the American model to feature townships of eight square miles, divided into thirty-six 800-acre sections. But when the survey was actually carried out, from 1869 to 1889, it returned to the six-square-mile townships of the American system, on a recommendation from the lieutenant governor of the Northwest Territories, who believed that most settlers were likely to come from the United States and would appreciate the familiarity. Index to townships in Manitoba, Saskatchewan, Alberta and British Columbia showing the townships for which official and preliminary plans have been issued up to January 1st, 1929. Topographical Survey of Canada, Department of the Interior. Compiled, drawn and printed by the Topographical Survey of Canada, Ottawa. Credit: Library and Archives Canada. Another difference between the American and Canadian surveys is the existence of road allowances in Canada. Where in the United States, sections are flush, and a road cuts into their land area, in Canada sections are spaced 20.12 meters (in Alberta/Saskatchewan) or 30.18 meters (in Manitoba) apart, adding slightly to the size of each township. 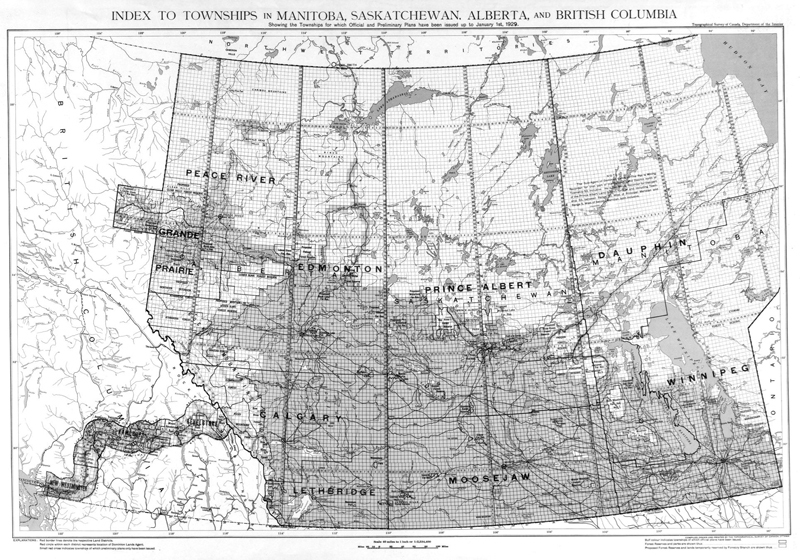 In Manitoba and southeast Saskatchewan, sections were bisected both vertically and horizontally; in Alberta and the rest of Saskatchewan — including Martin’s hometown on the western border of the province — they were bisected only vertically. Looking back at “Wheat,” then, the painting appears to present four quarter-sections in Alberta or Saskatchewan, and their according road allowances. 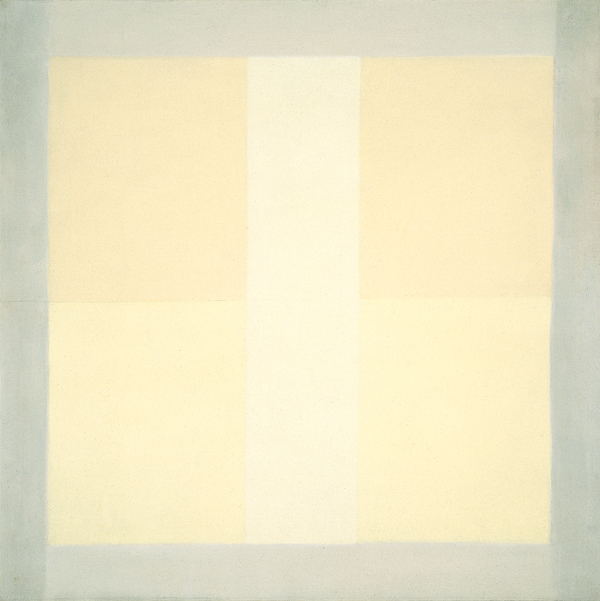 One can read other paintings of Martin’s, such as Untitled #5, which retains the isosceles rectangle as the unit of the grid, rather than the square, as zooming out, and further out, from the section. Source: Clear Directional Drilling Solutions. In 1931, Martin came to the United States to help her pregnant sister in Bellingham, Washington. She began studying at Western Washington University there, but eventually transferred to the Teachers College of Columbia University in Manhattan. Everyone from city planning professors to tourists, it seems, shares a common belief that Manhattan’s grid is the epitome of American urbanity. The city’s grid came into being after John Randel Jr., the New York City Planning Commission’s chief surveyor, conducted a survey of all 11,400 acres of Manhattan. Like the cadastral surveyors, Randel deliberately drafted his grid without regard to the island’s topography; like their survey, his was meant to be futuristic, utopian, and equitable, and to both represent and embody the remaking of the environment to fit the republican government of the newly independent nation. New York City commissioner’s plan. Circa 1820. After some time in New York, Martin traveled to New Mexico as a student at the University of New Mexico’s Summer Field School in Taos. Several years later, she matriculated at UNM in Albuquerque, and also taught art there. She returned to Columbia for her MA, which she completed in 1952, but left New York again in 1967, ghosting the art world for Galisteo, New Mexico, where she spent the rest of her life in solitude. 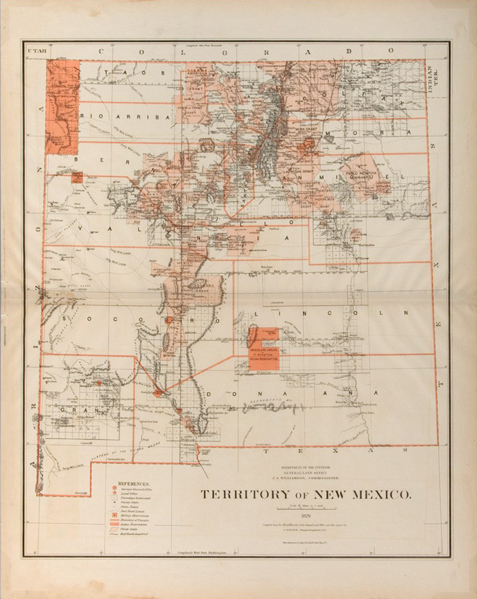 New Mexico’s “Initial Point,” from which all of that state and some of southern Colorado was surveyed, was established in April 1885 by surveyor John W. Garretson. It is located ten miles below the mouth of the Puerco River, on Black Butte, just southeast of the village of San Acacia, about two hours southeast of Martin’s home in Galisteo. Source: US Bureau of Land Management. The disappointed expectations of the survey belie the way that the grid begins to fall apart in New Mexico. The imagined grid of the survey has been overlaid on the state, but it lacks the practical power that it has in regions turned over to crop agriculture. It failed to divide the state according to its rules. 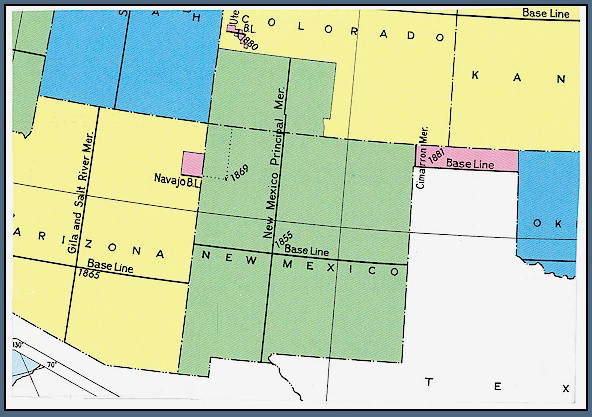 The second reason for the absence of a visible grid in New Mexico is the heritage of land grants. During Spanish rule (1769-1821), the crown promoted settlement of New Mexico territory by conceding the use of large landholdings for settlement, agriculture, and communal pasturing. During Mexican governance (1821-1848), the land grants continued as both private grants to individuals and communal grants to groups. Galisteo, where Martin settled, was a grant to the Galisteo tribe of indigenous peoples. New Mexico territory map, 1876. The Treaty of Guadalupe Hidalgo in 1848 promised to uphold the Spanish and Mexican grants, whose large size and unusual shape threw a wrench into the American government’s orderly and equitable plans for settlement. Although the grants still underwent massive speculation and theft by Anglo settlers and absentee investors, much of their land remained in large-scale cattle ranching, rather than being subdivided into homesteads. The geography of New Mexico is visibly different from much of the rest of the country as a result. This also makes New Mexico’s system of land tenure more akin to Canada’s than to the rest of the United States. In Canada, less than eleven percent of land is in private hands; the remainder is divided between federal and provincial “crown land.” As in New Mexico, the reason for this is the recognition that much of the country’s land makes more sense as forest or pasture than irrigated agriculture. The United States was so preoccupied with equitable distribution that it flouted USGS founder John Wesley Powell’s early warning that the arid West ought to be divided into parcels shaped by watersheds; instead, it willed its rectilinear yeoman order across the country. Because of this bias for cultivation, by now only an estimated 1-4% of the United States’ prairie remains. 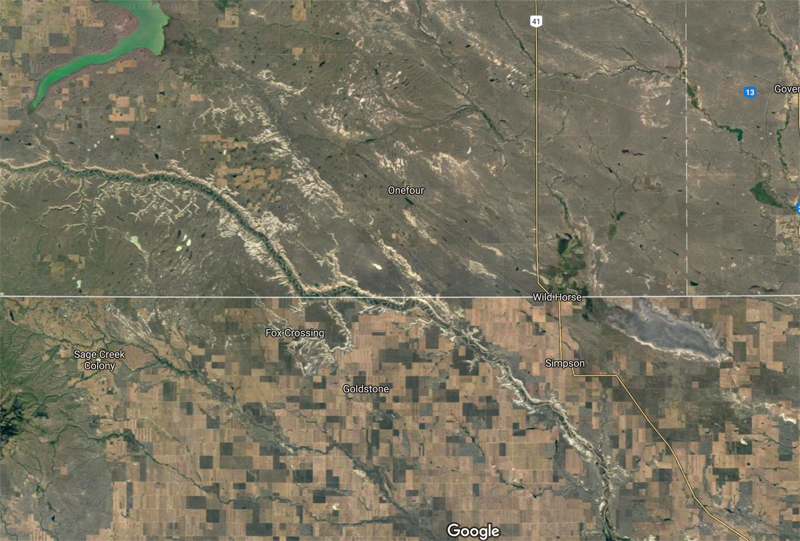 This is visible in aerial imagery of the Canadian-US border. What happens if we apply Krauss’s assessments to the grid of the cadastral survey? At first it seems that the survey grid’s inescapable functionality, both in gathering information about the young country and in organizing farmland, make it antithetical to the autotelic modern art grid. But it is its own map of itself, its own adversity to the world around it. Krauss writes that “no form within the whole of modern aesthetic production has sustained itself so relentlessly while at the same time being so impervious to change.” Certainly this is true of the survey grid. It has sustained itself even as the grid has ceased to be the form that orders towns and cities; it feels unlikely to ever disappear. Even when I fly home to Denver and see the eastern plains eaten up more and more each time by curlicue sprawl, the grid is intact and visible beneath the cul-de-sacs and backyards — because land is still bought and sold in quarter-section units. Krauss also writes that “flattened, geometricized, ordered, [the grid] is antinatural, antimimetic, antireal.” This, too, rings true as soon as one considers the gridding of anything that is not the glacially flat plain of the Midwest. The cadastral survey is America’s very landscape “turning its back on nature.” Divorced from its topography, its texture, the grid becomes a representation of a futuristic ideal that is blind to itself. Martin’s grids reflect not only their own abstraction, but a world ordered by such solipsistic, abstracted sovereignty. The year I worked for two friends who are ranchers in New Mexico, we repaired a fence line that went straight up the side of a mesa, with no nod to topography. My arms can still evoke the memory of the weight of the stacked steel T-posts, the ridges they dug into my skin, as I walked up, trying not to trip on rocks or get my leg caught on barbed wire, breathless and covered by locust spines nonetheless. My boss called out, “Damn pioneers!” as she tried to pull out a broken cedar fencepost from the compacted soil. When we got to the top, there was a lead survey marker hammered into a rock. Agnes Martin, Writings/Schriften, ed. Dieter Schwartz (Edition Cantz, 1993), 37.